The car falls on Danny. Shane tries to lift the car to help him out. Max asks Shane anxiously how his back is. Shane says it's OK and Max closes his eyes in relief. Maria comes in with an old newspaper and shows them an article she read about an old woman who lifted a van off her son. Max says it's the adrenaline rush - if only they could harness that power! He says they should work on it(!) He thinks Shane can start training again. Shane doesn't look convinced. The record has ended and Des is asleep on the sofa. Daphne comes in and Des wakes up. She tells Des the show was great. Des offers her a nightcap, but she doesn't want one. Daphne asks if Des was waiting up for her. Just then the phone rings and there's no-one there. Scary music plays and Des replaces the phone. Apparently a weirdo made a hissing sound. Des tells Daphne that he heard her walking around at about 3am. Des wonders if they should report it - it's happening too often for his liking. Daphne tells him not to worry about it. Des invites Daphne to go out for dinner with him tonight. She says she'd love to. Danny and Scott see Mrs Brown at the shops and hide from her. They make mooing noises and she drops her milk. They run off, laughing. Daphne is practising her dancing act, wearing a leotard, when a lady comes to the door. EILEEN: Does Desmond Clarke live here? Eileen is pleased that she's found the right place and says she'll come in and wait - she's come to stay. EILEEN: You see, I'm his mother. And you're exactly the way I imagined you, Lorraine! She hugs Daphne and kisses her on the cheek. Des comes in from the bank and messes about in the kitchen before he realises Eileen is there. DES: What the hell are you doing here, mum? EILEEN: Well that's a nice way to greet me when I've flown all the way from Perth. Eileen says that Daphne seems quite nice, although she dressed very unusually. Daphne told her she was the tenant. EILEEN: See what happens when you go so far away from home? DES: Obviously not far enough! Des says that Eileen didn't come to the wedding, but she said he didn't give her much warning - only a telegram the day before! Eileen says that Des has always been a bad judge of women. She wants to know what Des's relationship with Daphne is because she seems lovely. Des says they're just very good friends. DES: I *was* going to take her out to dinner, but I'll have to cancel it now that you're here. EILEEN: Oh, no, son, I wouldn't hear of it! Eileen insists that Des takes Daphne out and enjoys himself - they can talk later. Des is chuffed and hugs his mother. Max comes in in a very good mood. He's still very pleased about Shane. Maria tells him that she doesn't want to be a spoilsport, but he shouldn't be rushing Shane back to diving. The x-rays don't lie. But Max still thinks that a miracle has occurred where Shane is concerned. Maria still looks worried. 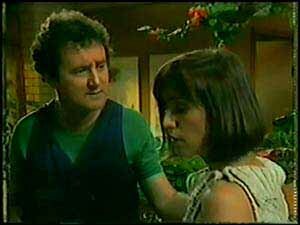 Mrs Brown sees Paul and tells him that she's having terrible trouble with possums running across the roof. She wants Paul to have a word with Daphne (she saw them going out last night) and ask her to stop feeding the possums. Paul isn't very pleased at Mrs Brown's attitude towards Daphne. Daphne and Eileen are getting on extremely well. Daphne gives her some of her magazines to read while they are out. EILEEN: Well don't you two rush your dinner on my account, you go out and enjoy yourselves. DAPHNE: Thank you, Mrs Clarke. It's lovely to have you staying here. Eileen tells Daphne that she's a lovely girl - an old-fashioned sort(!) Des and Daphne head off. As they do, Eileen has a bit of a turn. Daphne rushes to help Eileen. Des is unconcerned and says it's just indigestion. DES:(to Daphne) I'm sorry about dinner. The Ramsays are watching television. Maria turns the television off and says she's been to see Shane's doctor. He said that if Shane has just one dive he could be crippled for life. Max doesn't believe it, but Shane does. He tells Max that he's been to see the doctor himself - the x-rays are correct. Shane says that picking up the car was a one-off. Shane said that he didn't want to disappoint Max, but he can't dive again. Eileen is watering the garden when Julie and Mrs Brown come round. It seems Mrs Brown lives at Number 30. 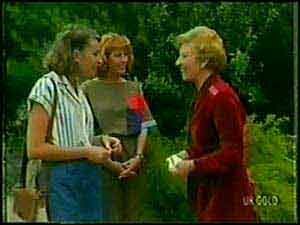 Julie tells Eileen that she and Des are old friends and they used to go out together. Eileen invites her in. Max comes to see Danny. He tells him he's very sorry about not being more concerned about Danny's injury. Then he says that he believes in Danny's ability, and wants Danny to have another go at training. He promises that he won't get mad at Danny again. Danny isn't convinced and says no. Eileen and Julie are having a cup of tea and a biscuit. Eileen tells Julie that she has an ailment that is a mystery to medical science - she doesn't say what it is, but apparently eating biscuits isn't good for it(!) She explains to Julie that she is divorced and lives alone - it's hard being away from Des. EILEEN: My first night here and I had an attack. Just as Desmond was about to go out with that nice Daphne. JULIE:(coldly): Like Daphne, do you? Eileen says that Daphne is very sweet. Julie doesn't say anything. She explains that she was Des's girl before Lorraine came along. She's over it now though. Eileen asks about why the wedding was called off, but Julie says she doesn't really know Lorraine's reason for dumping Des. Eileen says that at least Des has some nice friends, like Daphne. JULIE: She's quite nice...if you can accept what she does. JULIE: Mmm. That's why Carol Brown wouldn't come round here for a cuppa. And there's a few of the Neighbours that feel exactly the same way. EILEEN: Well...what does she do? I mean, she looks perfectly alright to me. JULIE: You obviously don't know. Daphne's a stripper. Eileen sits down in shock.